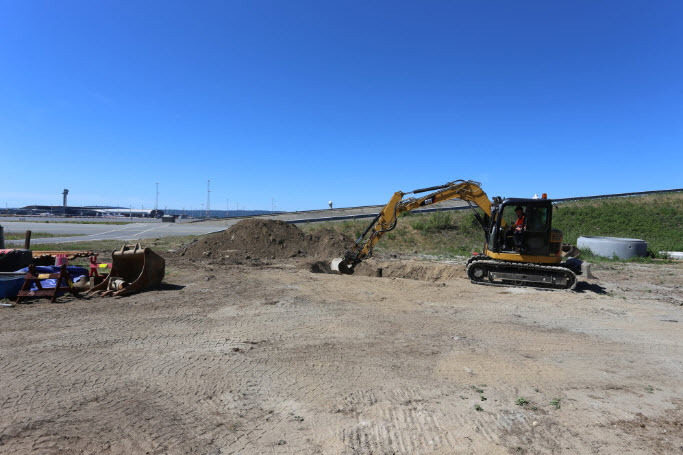 Avinor Oslo Airport has managed the energy project “Rock Energy” in partnership with Rock Energy AS Båsum Boring AS through their joint venture Norwegian Energy Drilling AS. In a controlled manner, the concept can send cold water deep underground, whereupon heated water is returned to the surface. This can then be used for heating building, or in the case of this project, to heat the engine test site and keep it clear of snow. 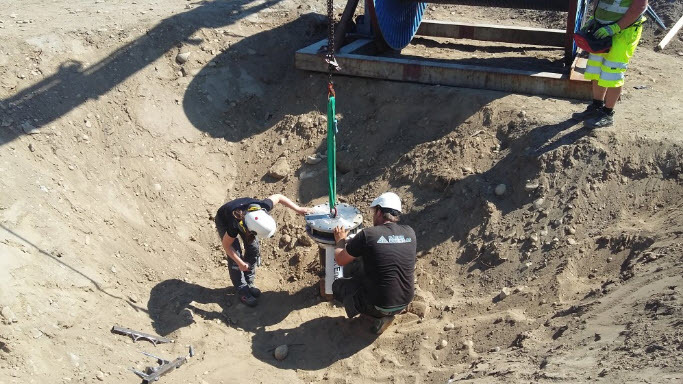 Not only is the technology groundbreaking, but never before has a Norwegian land-based geothermal borehole been drilled so deep. “The heat extracted from one of these boreholes corresponds to the effect of around one hundred radiators. Heat from the earth’s interior can provide huge amounts of energy. In fact, geothermal boreholes can provide a hundred times as much energy as hydropower, and it is this technology that Avinor is now exploiting at Oslo Airport. The product is almost indistinguishable from geothermal energy, but the boreholes are drilled significantly deeper and thus provide far more energy. Cold water is led down in pipes and heated by hot rock. “This saves us using both energy and snowploughs. In time we may also be able to reduce application of chemicals. At the same time, it is part of the work towards a more innovative and sustainable Avinor. We aim to be a driving force in environmental work in the aviation industry, and then we must have the courage to try out innovative solutions,” says Henning Bråtebæk, Director of Airside Operations. Oslo Airport and Rock Energy also have Innovation Norway on board. “Encouraging the development of new and eco-friendly environmental technology is one of the main focus areas of Innovation Norway. With world-leading expertise in drilling technology and drilling operations, technology for exploiting deep geothermal energy is considered one of our national competitive advantages. So far this kind of energy utilization has been too expensive and associated with risk, which has meant that it has been difficult to obtain funding and thus also public risk offloading for such projects. This project was deemed to resolve some of the challenges related to exploiting deep geothermal energy, both technologically and financially. Innovation Norway was thus of the opinion that it was important to go ‘all in’ on this project in terms of both development and investment. This way, we want to contribute to developing knowledge and experience, and thus that deep geothermal energy becomes a profitable green energy option. In addition to developing a sustainable Norwegian industry, we want this to go international and contribute to the global green shift,” he says. Renewable energy from shallow geothermal boreholes, also called geothermal plants, is energy from the top 2-300 metres of the surface. Renewable energy from deep geothermal boreholes is heat from depths of 1,500-6,000 metres. The boreholes at Oslo Airport are unique because they are the first geothermal boreholes to be drilled deep into hard Norwegian bedrock. The temperature in the ground rises by approximately 20-25 degrees for each kilometre drilled. Renewable energy from deep geothermal boreholes is heat from levels at depths of 1,500-6,000 metres. Deep geothermal boreholes have lifespans of several generations to come, because the rock doesn’t stop producing heat. The footprint is minimal, roughly the size of a manhole cover. The heat from the ground can easily replace other, less eco-friendly energy sources.